Inn Serendipity Woods is an evolving 30-acre private wildlife conservation area and rural retreat cabin. 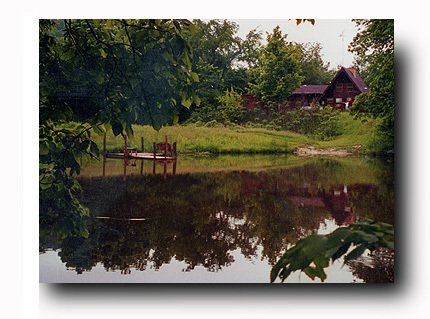 Guests sleep in a completely furnished, but simple, A-frame cabin adjacent to the pond. Inn Serendipity Woods is a sanctuary for all who visit and the critters that call it home. It includes a spring-fed 1-acre pond with bass and bluegill, a small creek running through the property, and rock outcroppings that peek out from the birch and aspen forests. The property is home to a diverse wildlife population including turkey, fox, coyote, Whitetail deer, raccoon, pheasant, and a host of songbirds and other forest bird species. It's ideal for the active birder. Located in rural Vernon County, a seven minute drive southwest of Hillsboro, Wisconsin, the property is nestled in the driftless region of Wisconsin, known as such because the glaciers and their leveling effects missed the region, resulting in the rolling hills and steep rock outcroppings for which the area is renowned. Perfect for hiking on deer trails, bird watching, morel (mushroom) hunting, swimming, or just relaxing amongst the birch, oak and aspen forest, Inn Serendipity Woods can rekindle the ecological spirit and your connection to the Earth. Nearby activities abound. A bicycle trail starting in Hillsboro -- exactly a 6 mile bike ride from the doors of Inn Serendipity Woods -- connects to the famous Elroy-Sparta State Bicycle trail. Within an hour drive are the Wisconsin Dells, Amish settlements, canoeing on the Kickapoo River, some of the best fishing in Wisconsin along the West Fork of the Kickapoo River for the spin anglers and fly casters, and rugged hiking or horseback riding in the spectacular Wildcat Mountain State Park. Copyright © Inn Serendipity.All rights reserved.